A bank run (also known as a run on the bank) occurs when, in a fractional-reserve banking system (where banks normally only keep a small proportion of their assets as cash), a large number of customers withdraw cash from deposit accounts with a financial institution at the same time because they believe that the financial institution is, or might become, insolvent; and keep the cash or transfer it into other assets, such as government bonds, precious metals or stones. When they transfer funds to another institution it may be characterised as a capital flight. As a bank run progresses, it generates its own momentum: as more people withdraw cash, the likelihood of default increases, triggering further withdrawals. This can destabilize the bank to the point where it runs out of cash and thus faces sudden bankruptcy. To combat a bank run, a bank may limit how much cash each customer may withdraw, suspend withdrawals altogether, or promptly acquire more cash from other banks or from the central bank, besides other measures. A banking panic or bank panic is a financial crisis that occurs when many banks suffer runs at the same time, as people suddenly try to convert their threatened deposits into cash or try to get out of their domestic banking system altogether. A systemic banking crisis is one where all or almost all of the banking capital in a country is wiped out. The resulting chain of bankruptcies can cause a long economic recession as domestic businesses and consumers are starved of capital as the domestic banking system shuts down. According to former U.S. Federal Reserve chairman Ben Bernanke, the Great Depression was caused by the Federal Reserve System, and much of the economic damage was caused directly by bank runs. The cost of cleaning up a systemic banking crisis can be huge, with fiscal costs averaging 13% of GDP and economic output losses averaging 20% of GDP for important crises from 1970 to 2007. Several techniques have been used to try to prevent bank runs or mitigate their effects. They have included a higher reserve requirement (requiring banks to keep more of their reserves as cash), government bailouts of banks, supervision and regulation of commercial banks, the organization of central banks that act as a lender of last resort, the protection of deposit insurance systems such as the U.S. Federal Deposit Insurance Corporation, and after a run has started, a temporary suspension of withdrawals. These techniques do not always work: for example, even with deposit insurance, depositors may still be motivated by beliefs they may lack immediate access to deposits during a bank reorganization. Many of the recessions in the United States were caused by banking panics. 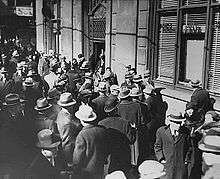 The Great Depression contained several banking crises consisting of runs on multiple banks from 1929 to 1933; some of these were specific to regions of the U.S. Banking panics began in the Upper-South in November 1930, one year after the stock market crash, triggered by the collapse of a string of banks in Tennessee and Kentucky, which brought down their correspondent networks. 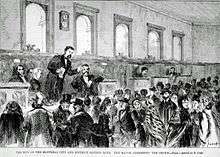 In December, New York City experienced massive bank runs that were contained to the many branches of a single bank. Philadelphia was hit a week later by bank runs that affected several banks, but were successfully contained by quick action by the leading city banks and the Federal Reserve Bank. Withdrawals became worse after financial conglomerates in New York and Los Angeles failed in prominently-covered scandals. 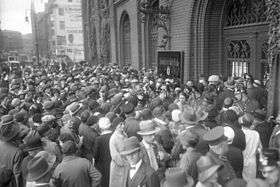 Much of the Depression's economic damage was caused directly by bank runs. Milton Friedman and Anna Schwartz argued that steady withdrawals from banks by nervous depositors ("hoarding") were inspired by news of the fall 1930 bank runs and forced banks to liquidate loans, which directly caused a decrease in the money supply, shrinking the economy. Bank runs continued to plague the United States for the next several years. City-wide runs hit Boston (Dec. 1931), Chicago (June 1931 and June 1932), Toledo (June 1931), and St. Louis (Jan. 1933), among others. Institutions put into place during the Depression have prevented runs on U.S. commercial banks since the 1930s, even under conditions such as the U.S. savings and loan crisis of the 1980s and 1990s. Some measures are more effective than others in containing economic fallout and restoring the banking system after a systemic crisis. These include establishing the scale of the problem, targeted debt relief programs to distressed borrowers, corporate restructuring programs, recognizing bank losses, and adequately capitalizing banks. Speed of intervention appears to be crucial; intervention is often delayed in the hope that insolvent banks will recover if given liquidity support and relaxation of regulations, and in the end this delay increases stress on the economy. Programs that are targeted, that specify clear quantifiable rules that limit access to preferred assistance, and that contain meaningful standards for capital regulation, appear to be more successful. According to IMF, government-owned asset management companies (bad banks) are largely ineffective due to political constraints. A silent run occurs when the implicit fiscal deficit from a government's unbooked loss exposure to zombie banks is large enough to deter depositors of those banks. As more depositors and investors begin to doubt whether a government can support a country's banking system, the silent run on the system can gather steam, causing the zombie banks' funding costs to increase. If a zombie bank sells some assets at market value, its remaining assets contain a larger fraction of unbooked losses; if it rolls over its liabilities at increased interest rates, it squeezes its profits along with the profits of healthier competitors. The longer the silent run goes on, the more benefits are transferred from healthy banks and taxpayers to the zombie banks. The term is also used when a large number of depositors in countries with deposit insurance draw down their balances below the limit for deposit insurance. The bank panic of 1933 is the setting of Archibald MacLeish's 1935 play, Panic. Other fictional depictions of bank runs include those in American Madness (1932), Mary Poppins (1964) and Noble House (1988). 1 2 3 4 5 6 7 8 9 10 11 12 Diamond, D. W. (2007). "Banks and liquidity creation: a simple exposition of the Diamond-Dybvig model" (PDF). Fed Res Bank Richmond Econ Q. 93 (2): 189–200. 1 2 3 4 5 6 7 Laeven, L.; Valencia, F. (2008). "Systemic banking crises: a new database" (PDF). IMF WP/08/224. International Monetary Fund. Retrieved 2008-09-29. 1 2 Wicker, E. (1996). The Banking Panics of the Great Depression. Cambridge University Press. ISBN 0-521-66346-6. 1 2 Bernanke, B. S. (1983). "Nonmonetary effects of the financial crisis in the propagation of the Great Depression". Am Econ Rev. 73 (3): 257–76. 1 2 Heffernan, S. (2003). "The causes of bank failures". In Mullineux AW, Murinde V. Handbook of international banking. Edward Elgar. pp. 366–402. ISBN 1-84064-093-6. 1 2 Reckard, E. S.; Hsu, T. (2008-09-26). "U.S. engineers sale of WaMu to JPMorgan". Los Angeles Times. Retrieved 2008-09-26. ↑ Gross, David M. (2014). 99 Tactics of Successful Tax Resistance Campaigns. Picket Line Press. p. 176. ISBN 978-1490572741. ↑ Richardson, G. (2007). "The collapse of the United States banking system during the Great Depression, 1929 to 1933, new archival evidence" (PDF). Australas Account Bus Finance J. 1 (1): 39–50. ↑ Fuller (2011) 28–31, 66–67, 97–98. 1 2 Diamond, D. W.; Dybvig, P. H. (1983). "Bank runs, deposit insurance, and liquidity" (PDF). J Pol Econ. 91 (3): 401–19. doi:10.1086/261155. Reprinted (2000) Fed Res Bank Mn Q Rev 24 (1), 14–23. ↑ Cooper, R.; Ross, T. W. (2002). "Bank runs: deposit insurance and capital requirements". Int Econ Rev. 43 (1): 55–72. doi:10.1111/1468-2354.t01-1-00003. ↑ Barrell, R.; Davis, E. P. (2008). "The evolution of the financial crisis of 2007–8". Natl Inst Econ Rev. 206 (1): 5–14. doi:10.1177/0027950108099838. ↑ Merton, R. K. (1968) . Social Theory and Social Structure (enlarged ed.). New York: Free Press. p. 477. ISBN 978-0-02-921130-4. OCLC 253949. ↑ "The only way to stop a eurozone bank run". Financial Times. ↑ Lietaer, B.; Ulanowicz, R.; Goerner, S. (2008). "Options for managing a systemic bank crisis". S.A.P.I.EN.S. 1 (2). ↑ Kane, E. J. (2000). "Capital movements, banking insolvency, and silent runs in the Asian financial crisis". Pac-Basin Finance J. 8 (2): 153–75. doi:10.1016/S0927-538X(00)00009-3. 1 2 3 4 Zoe Chase (2012-06-11). "Three Ways To Stop A Bank Run". NPR. 1 2 Chana Joffe-Walt (2009-03-26). "Anatomy Of A Bank Takeover". NPR. ↑ Allen, W. R. (1993). "Irving Fisher and the 100 percent reserve proposal". J Law Econ. 36 (2): 703–17. doi:10.1086/467295. ↑ Fernandez R, Schumacher L (1997). "Does Argentina provide a case for narrow banking?" (PDF). In Bery SK, Garcia VF. Preventing Banking Sector Distress and Crises in Latin America. World Bank Discussion Paper No. 360,. pp. 21–46. ISBN 0-8213-3893-5. ↑ Brusco, S.; Castiglionesi, F. (2007). "Liquidity coinsurance, moral hazard, and financial contagion". J Finance. 62 (5): 2275–302. doi:10.1111/j.1540-6261.2007.01275.x. Kaufman, George G. (2008). "Bank Runs". In David R. Henderson. Concise Encyclopedia of Economics (2nd ed.). Indianapolis: Library of Economics and Liberty. ISBN 978-0865976658. OCLC 237794267.